Well we're coming up to a long weekend here in Greece so I thought I'd make you a mix'n'match selection of Lenten things English and Greek to try out at home! In Greece you celebrate 'Tsikno Pempti' which I jokingly translated as 'Toasted Thursday'. I guess the best translation would actually be 'sauteed' or 'roasted' or even 'charred'. (Depending on how well you cook!) As far as I know this is a day when you eat up all the meat in preparation for the 40 day fast of Lent. Then you have 'Clean Monday' when Lent begins. In England, in times past, we celebrated 'Callop' or 'Fat Monday' (Callop is an old English word for fat). This was the last day before Lent when all the forbidden foods such as fats, eggs and meat could be eaten. Now we celebrate 'Shrove Tuesday' only. Traditionally this day was the last before Lent and Christians went to church to confess their sins and were 'shriven' or forgiven in other words. 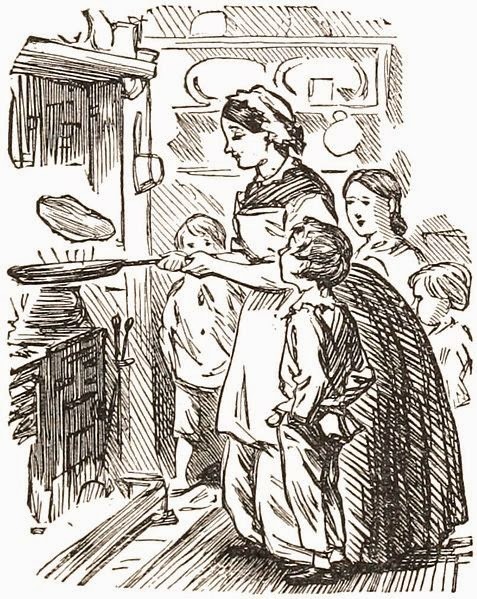 Nowadays, the Collop Monday traditions have been absorbed into one big Shrove Tuesday celebration. We eat pancakes, something like a crepe, on this day. Traditional pancakes are sprinkled with sugar and lemon juice. In England people do fun things with pancakes other than just eating them. They toss them, they race with them, they use them for raising money for charity. Check out these politicians and reporters racing and tossing pancakes to give you an idea of what I mean! Want to try it at home? Have no fear! Just watch yourselves with those hot frying pans! 1. Put all the ingredients EXCEPT the oil/butter into a bowl and mix with an electric whisk/mixer for five minutes. 2. Heat enough oil/butter to cover the bottom of a frying pan. 3. Spoon in enough mixture to cover the base of the pan and cook until the mixture begins to bubble. 4. Check to see if it's golden brown underneath and then turn it or, if you are feeling brave, toss it. 5. When the other side is cooked turn it out onto a plate and squeeze lemon juice over it and sprinkle a generous amount of sugar on that then roll it up and serve hot. Yummy, yummy in your tummy! So now you have stuffed your faces it's time you got out and took some exercise!